Kingston University invests in student education with audio-visual upgrade. Based in south-west London, Kingston University is home to over 20,000 students and 2,000 members of staff. The University spans five different campuses in and around Kingston upon Thames, where it opened as Kingston Technical Institute in 1899. The University is undergoing a £30million IT infrastructure project, which includes 3,500 high speed wifi hotspots, 5,000 new PCs, fully managed desktops and VDI and a major AV rollout. 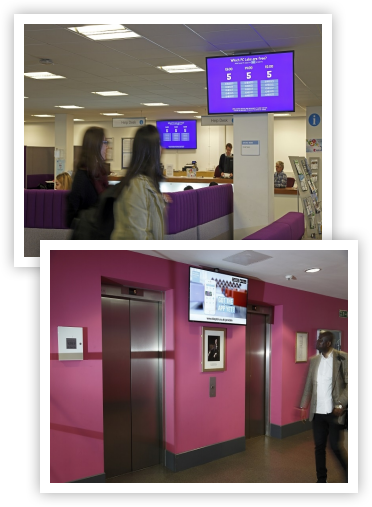 As part of the AV rollout, in the summer of 2015, 60 Panasonic professional displays were installed for a digital signage roll out across the University. It follows on from the installation of 170 Panasonic PT-RZ370 laser/LED projectors in September 2014. Both projects came about as a result of the strategic partnership between Kingston University and GV Multimedia. Interactivity and content sharing are two key trends in the AV market, which have undoubted benefits for the education sector. Kingston University is invested in this area to ensure that students at the University have a first class learning environment. The display project, won and implemented by GV Multi-media, included 48 50-inch TH-50LFE7E displays, six 65-inch TH-65LFE7E, five 47-inch TH-47LF6W displays and a single 80-inch TH-80LFC70. The University will use the digital signage for more efficient information sharing and wayfaring at the University. They make it simple to display messages across the University which encourages active student engagement. The screens provide high quality, HD content on displays that require minimal set-up time and feature low power consumption. 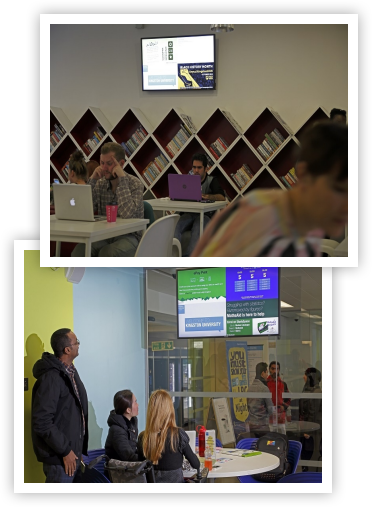 Content is managed remotely from the displays and identical content can be displayed across all five campuses using the One Lan digital signage solution. Such digital signage solutions for education replace static text and pictures with eye-catching displays that can incorporate moving images, video, TV, scrolling text and messages that create an impact. The system means that it’s easy to change content across the display network quickly and efficiently. The display project comes just 12 months after the University completed the installation of 170 laser projectors which, at the time, represented the biggest deal of its kind in the company’s history. The project saw PT-RZ370 projectors installed in 119 lecture and seminar rooms. The 3,500 ANSI lumens PT-RZ370 is part of the SOLID SHINE range which delivers high levels of reliability and long lasting brightness thanks to the LED/laser-combined light source. The projector provides approximately 20,000 hours of operation, with no lamp or filter replacement needed, making it a perfect choice for the education sector where long term operation is key. Kristian Cutting, Sales Director at GV Multi-media, said, “For the second year, the University has made a significant investment in improving its audio-visual infrastructure. The Panasonic displays are part of a digital signage project that allows content to be managed and displayed across all five campuses using the ONELAN digital signage solution.